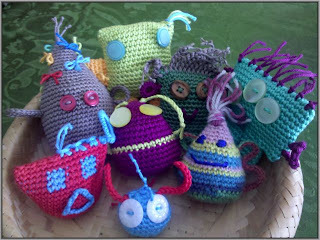 If you're wondering what else I've been up to lately ... here it is ... the Crunchies! They even have their own Crunchies blog here. I hesitate to call them amigurumi, though some might classify them that way. They hate labels, so well, I'll just call them Crunchies. I've never done weaving on a big scale before, actually, other than using a potholder loom and fashioning a little loom out of some cardboard, I've never done much weaving at all! 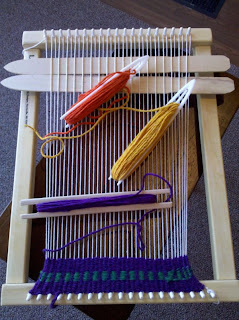 To get a taste I got a simple lap loom and have decided to give it a go. It came with one shuttle and I dug out some netting shuttles that I had kicking around from when I tried my hand at netting a few years ago. 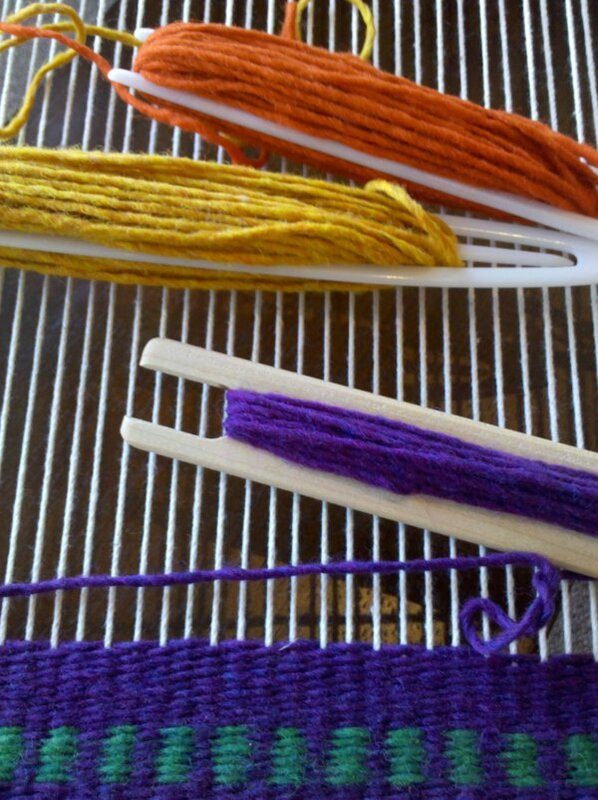 It seems like slow work, but maybe that's just because I'm new to it. 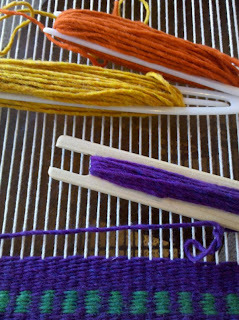 Think I might experiment with the various colors and see how it goes ... more pics to follow! Last weekend I went to some yard sales. 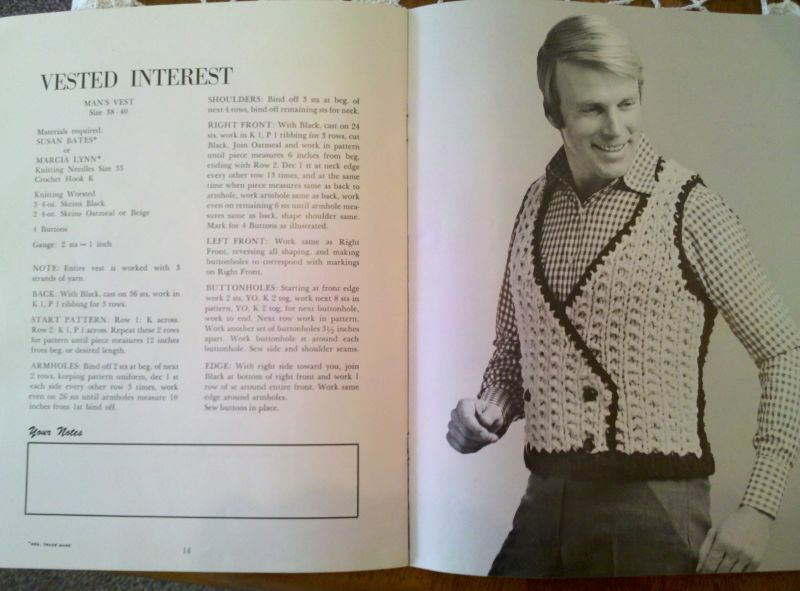 It's always fun to come upon vintage fiber arts books .... mainly because the photos are usually just so dated that they are absolutely awesome! 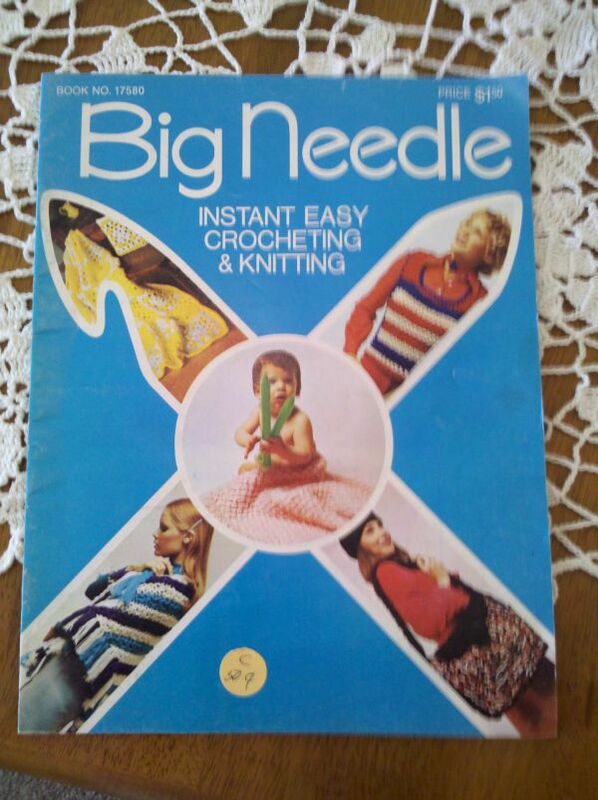 I came upon this book of "big needle"knit and crochet patterns. 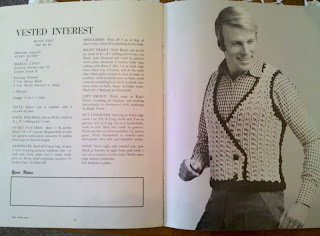 I'm not sure when it was published, but I'm figuring by the styles it's probably from the 70s. here's the cover ... hey, who gave that baby those huge knitting needles to play with!! The picture is black and white, but I think you get the idea.... I would love to see my husband in this one! The checkered shirt was a nice touch to the whole ensemble too. One of the most fun parts of summer around where I live is going to yard sales... yay! Today, a neighboring town had their "town-wide" yard sale. It would have been possible to spend much of the day there poking around and hunting down some great buys. Of course, I didn't have all day, but I did have time to wander down a few streets and look things over. I generally scan the tables and boxes and head for anything that looks craft related since I never know what I might find. Today it was all about buttons! As a child I was always fascinated by going through my mother's big green sewing box and looking at all the odds and ends of things in there and wondering what on earth one did with some of that stuff! She had a small plastic box she kept in her sewing box that contained buttons, cause, well ... you never know when you might lose one and need a replacement! These containers all had buttons (and few other sundry items). I find it interesting the various containers people use for their buttons. This was a great collection: a margarine tub, little plastic box, whipped topping container, old pill bottle and a couple generic plastic containers. I thought they warranted a picture before I sorted through them and added them to my own button box. Buying things like this always make me think about the people who owned them, what they were like, if the contents of these little containers met much to them. Of course, I wonder if someday someone will be going through my button box. This one was my grandmothers. I'm not sure what the original purpose of the box was, maybe some type of butter box.